64 Classic BOSS Pedal Settings - at the press of a couple of switches! 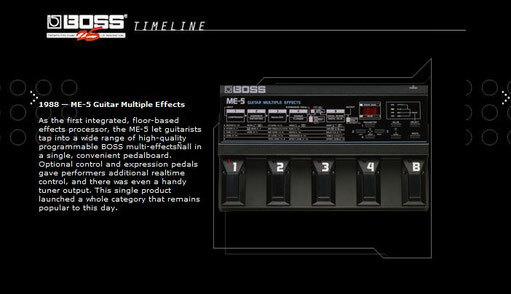 There was one thing that BOSS very cleverly incorporated into the ME-5 and that was MIDI. 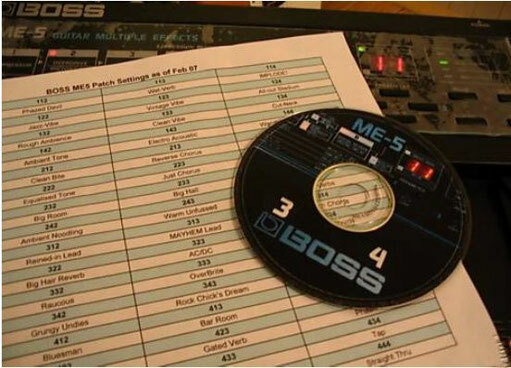 With its ability to recieve control Change information via standard System Exclusive (SYSEX), it meant that all the parameters and settings, locations and presets, could all be uploaded and downloaded to the unit 'on-the-fly' and edited via software on a computer or dedicated sequencer! This has also meant that over 28 years on and you can still use this facility reliably either live or in the Studio. You can also very easily and remarkably quickly, use it to upgrade your old pre-sets to Modern or Vintage Patches!! !UPGRADE YOUR ME-5 with BOUTIQUE.CLASSIC TONES!